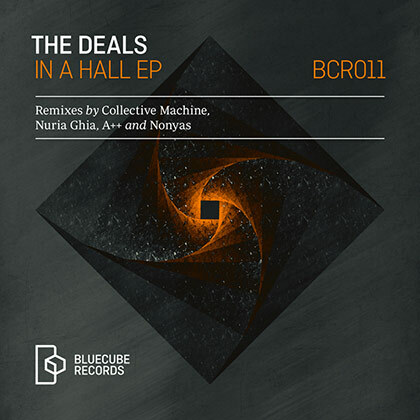 Nuria Ghia’s label, BlueCube Records, presents In a Hall EP by The Deals, a collection made up of four original cuts and four spectacular remixes. In a Hall’s eight tracks are ready to rock any hall, club, basement or outdoor party going. Combining an essence of slick tech-house production with elements of deep and otherwise sombre moods in between, this eclectic EP makes a nice statement on a dance label very much on the rise. Kicking off the EP, title track In a Hall brings elements of groovy techno and smooth sounds as its main appeal delves towards its subby bassline and moments of snappy percussion and delays. Hitting more of a tribal influence is second track Pandora Groove, as the steady beat and drummy rhythms release themselves over darker breaks of resonating chords and vocal change-ups. To My Mouse inches into the techno world as its repetitive yet hypnotic nature is broken up by softer pad hits that compliment an aggressive beat. Nuria Ghia packs yet another powerful remix with her version of To My Mouse. Almost submerged in a constant wave of low-end kick and bassline, it moves in and out of lighter breaks but instantly snaps back to a rocking arrangement of perfected techno. Overall the release brings the party to wherever one may be listening. As BlueCube continues to strive to support the Spanish scene and its artists, the world is gaining a healthy respect and yearning for new-generation production gurus via the label’s strong release catalogue.